Jaermann & Stübi do not rest on their laurels: just two years after their first successful collection they have introduced a new series for the ambitious golfer with a low handicap. The "Royal Open" models once again offer intelligent additional functionality for golfers as well as an innovative (patent pending) shock absorber. The new collection is also the first with a model designed for women. Those who play in golf tournaments frequently know that they often last much too long. A round of golf should take four hours; in reality, however, it is often five or more. Thus the new "Royal Open Course Timer & GMT" model has a timer function which always shows how long a round of golf has been in progress. The same additional function can also be used as a second time zone. A rotating crown enables the outer hour ring to be turned and set to the tee time or second time zone. It is simple to operate and can be read at a glance. Those who love to golf and treasure mechanical watches but desire no additional functions should wear the "Royal Open" from J&S. This sophisticated, classic watch with a shock absorber and automatic movement combines sportiness and elegance in a unique way and always looks good off the golf course as well. The "Royal Open" Ladies' collection from Jaermann & Stübi is the first brand focus for women who want a sophisticated, elegantly sporty watch on the golf course. The models are designed to go with the two most important fashion colors for the 2009 golf season. 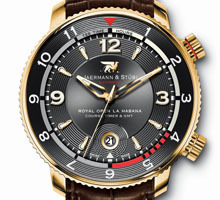 The dial is optionally available with 8 diamonds as an index. To ensure that the cigars always enjoy the right climate on the course and at the 19th hole, the watch box of the Royal Open La Habana is also a sophisticated humidor as a homage to all true aficionados. Long before the tour appearances of Miguel Angel Jimenez, aficionados have known that a good cigar can enhance the game. Fidel Castro and Che Guevara also enjoyed the game of kings during their legendary match at the Villareal Golf Club in Cuba. 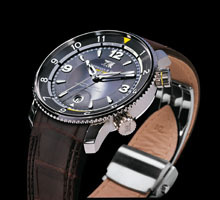 The new "Royal Open" models are distinguished by traditionally elegant and thus timeless design. The large numbers and clear indices are easy to read and give the series a distinctive look. Like the "Stroke Play" collection by Jaermann & Stübi, the "Royal Open" collection also has a Caliber A10 automatic movement. The cases are made of stainless steel, black PVD or a particularly bright, 18-carat yellow gold and are waterproof up to 100 meters. 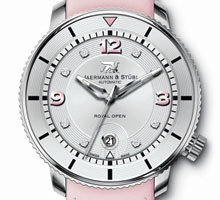 All "Royal Open" timepieces have a new patent pending shock absorber with a flexible stem. move unhindered in the case, providing even better protection against strokes and impacts. The movement and the G-Shock-Guard can be seen through a large glass back.